The course begins with outdoor drawing work. 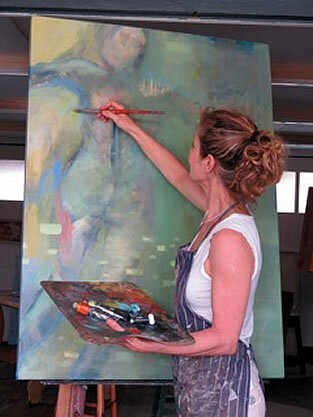 Follow-up processes in the studio introduce invigorating methodology and techniques to explore and facilitate exciting ways to turn on-site observational sketches into paintings. The emphasis is on expression rather than illustration; the development of a love for paint as an experiential, expressive medium to explore on canvas the multi-sensory experience of being in nature. Debbie Field majored in fine art at Wits University. She studied oil painting with Greg Kerr, Ryno Swart and Jill Trappler. Together with Ryno Swart, Gavin Calf and other artists, Debbie was a founder member of “The Artists Co-Operative” now based in Simonstown. She has studied ceramics with Wilma Cruise and Barbara Jackson. Her ceramic work and paintings have been shown in several group exhibitions in Cape Town and Johannesburg, with work in private collections both locally and abroad. Most recently, her deep interest in the power of the creative impulse has led to her collaboration with dancer Balu Nivison. In 2014, she started a collaboration with UK artist Emily Ball. In 2015, she began to teach art to the students of Indoni Arts Academy in Gugulethu. She currently teaches and works from her own studio in Cape Town.